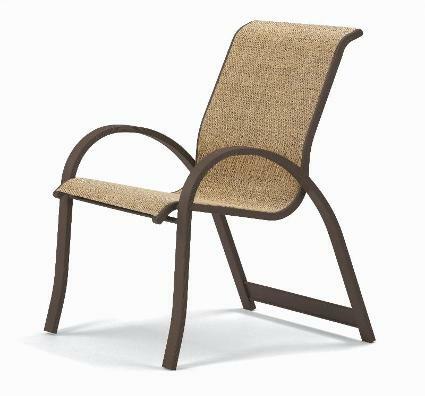 Telescope Aruba II Sling Stacking Arm Chair. Colors shown in photo: Frame - Textured Beachwood. Fabric #803 Bailey. Dimensions: 25" wide x 34.75" high x 28.5" deep with 18.25" seat height. Frame Colors to Choose From when Ordering: Gloss White, Textured Snow, Textured Warm Gray, Textured Desert, Textured Beachwood, Textured Kona, Textured Silver, Textured Graphite, Textured Black, Textured Navy. We have frame color samples and fabric swatch books at our store.